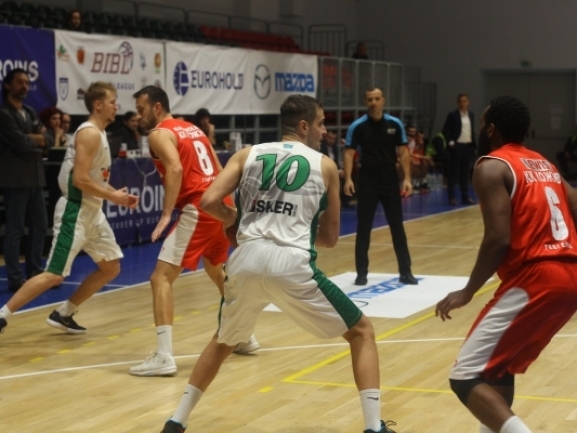 KK Kozuv recorded its first win of the season in the Balkan League. The Gevgelija side defeated BC Barsy Atyrau 82-73 away in a thrilling and exciting game. The Macedonians led by a good margin for a long time but in the end the Kazakhstan team came close and had some chance. The more experienced side of Kozuv however managed to close out game and Barsy′s first trip to the Balkans finished with three straight defeats. Barsy had a perfect start to the game and scored the first 12 points. Kozuv however responded with 11-0 run to close the gap and soon after took the lead. The visitors were up by a point after ten minutes and the game was close until the middle of the second quarter. Then Kozuv made another good run and finished the first half on a 13-4 run to be up by 13 points at the break. An 11-3 start to the second half increased Kozuv′s advantage even more. After that moment however the Kazakhstan team started playing better. They improved both their offense and defense and that turned out to be working well. This is how the hosts managed to close the gap to just 9 points after the third quarter and gave themselves a chance. The home side didn′t stop trying and with four minutes to go the deficit was just 5. The game however was decided when with 58 seconds to play Nacevski hit a triple to make the difference 10 points after which there was no comeback for Barsy. The winners were led by Robert Lewis who finished with 18 points and 7 assists. Nikola Karakolev did good before fouling out to end with 17 points as Miladin Pekovic had 15. Dmitryi Klimov was the top scorer for Barsy with 19 points. Bojan Bakic also did well with 14 points while Pavel Ilyin had 13, 7 rebounds and 7 assists.